* All figures stated are approximate and subject to change without notice. AquaNui CT is made in the USA by a family-owned business. In fact, we are the only company producing an American-made countertop water distiller. 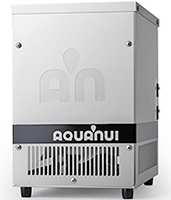 The AquaNui CT produces 0.8 gallons per batch and fits snug in tight spaces. Like all AquaNui distillers, the CT features American-made stainless steel. It comes with a storage container, but you can order extra containers and bottles. The AquaNui CT has the steam sterilization option which no other countertop distiller on the market offers. This appliance does not require installation and is perfect for small families, apartments, RVs, marine vessels, dental clinics and school labs. It’s easy to use. AquaNui is made in the USA by a family-owned business that has been making premium water distillers for more than three decades. The AquaNui CT comes with a 15-year limited warranty—including a 2-year full warranty on electrical parts. Patented design. Regular tap water is poured into the boiling tank. A heating element boils the contaminated water and the steam rises. The steam passes into the condensing coil, and the impurities are left behind. A fan cools the steam and converts it to water — pure, distilled water. A glass storage container holds nearly one gallon of distilled drinking water that can be dispensed through the pour-through lid.